Freelance business is a moving target. We hustle to get clients, but how do you get them to re-hire you? 1) Do a great job on the project. This may seem like common sense, but it goes without saying that a client won’t hire you again if you do sloppy work, or don’t finish the project you proposed. Always create the best work you possibly can. Meet or exceed their expectations. 2) Stick to your deadline and respond in a timely manner. It’s important to respond to emails in a timely manner and finish projects on-time. I always tell my college students, “not responding at all to an email doesn’t mean ‘I read it and I understand’”. You don’t need to respond if the answer is simply “thanks”, but otherwise it’s usually a good idea to write something back. I’d suggest checking your email 2-3 times a day and getting back to every project related email within 24 hours during the work week. Your clients want to know they can count on you. Most people are so busy they don’t have time to be keeping track of lost projects. 3) After the project invite them to join your email list. Your email list can have free products or helpful tips (with the occasional sales pitch if you are running a new service or something). There are a ton of ideas online about email marketing. This keeps people in your radar so they think of you when the time comes to hire for a project. 4) Reach out in a couple of months. If they aren’t interested in your list, you can reach out to them in a couple months with a friendly “hi, hope you are doing well. How did that project work out for you, etc)”. Again, it’s more about saying “I’m still here”, not “you should hire me again”. Above all, I think the most important aspect is just building a personal/professional relationship with them. Get to know them on a professional level and get to know their business. 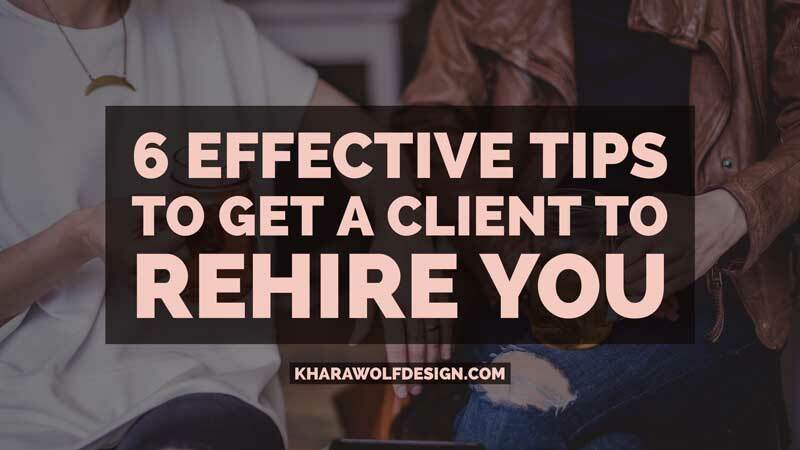 6) Always have one more client then you actually need. It’s ok if they don’t re-hire you. It’s not personal. Not all people are going to need ongoing projects. Maybe their budget changed or they are focusing on a different part of their business. Part of freelance is always keeping 1 more client then you really need because they will come and go!